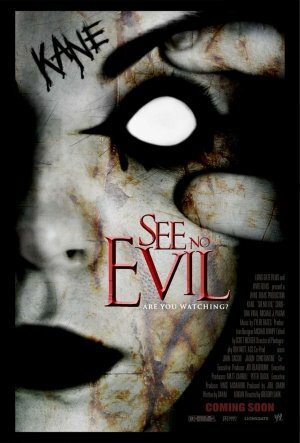 In “See No Evil ,” Glen Jacobs plays Jacob Goodnight, a psychopath picking off teenagers stuck in a run down hotel. Wrestling fans know Jacobs better as Kane, the WWE “Big Red Monster,” a 7-foot tall behemoth with some anger management issues. Playing a meathook-wielding maniac may not be much of stretch for Jacobs, but wrestlers-turned-actors aren’t often asked to play against type. Still, there have been some memorable big screen turns by denizens of the ring. At the sound of the bell, our Ten Favorite Cinematic Performances by Wrestlers! 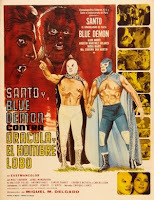 Choosing just one El Santo film from an oeuvre of over 50 is like trying to find the best lobster in the tank. One may be slightly better than the rest, but they all pretty much taste the same and they’ll all snap at you before you drop ‘em in boiling water. Our simile may be ridiculous, but so were the movies of Mexican wrestling icon El Santo (Rodolfo Guzman Huerta), pitting him against monsters, aliens, robots and other super villains over a period of three decades. For your consideration, we’ll arbitrarily select “Santo y Blue Demon Contra Dracula y el Hombre Lobo” (“Santo and the Blue Demon Versus Dracula and his friend the Wolfman”) because it’s a great title and it’s available on DVD! ¡Viva el Santo!! We’re listing both of these wrestlers’ roles in Patrick Swayze’s anti-classic, “Road House” because how can you pick one nuanced performance over the other? As the bouncer with a bad attitude, Terry Funk channels the misdirected passion of Montgomery Clift! And as... uh... another big dude who likes to fight, Cowboy Bob Orton recalls the simmering angst of a young Brando! Remember, kids, “pain don’t hurt,” even when someone’s pulling on your mullet and forcing you to listen to Jeff Healey! This bio-pic about Andy Kaufman (played by Jim Carrey) recreates one of the legendary comedian’s most notorious moments, an on-air battle with pro wrestler Jerry Lawler (playing himself). In the early ‘80s, Kaufman, the self-proclaimed “Inter-Gender wrestling champion of the world” would wrestle any woman, invariably beating her, hurling insults about feminine inferiority. Feeling that Kaufman was likewise mocking the sport, wrestler Jerry Lawler began a very public bashing of the comedian, baiting him into a match that ended with a series of crippling, illegal pile-drivers. Some months later, the two enemies appeared on Late Night with David Letterman, where verbal sparring turned into head slapping and coffee throwing. Only years after Kaufman’s untimely death from cancer was it revealed that the whole rivalry was a set-up, a grand bit of performance art, perhaps the greatest acting job ever by a wrestler. Actor / wrestler Mike Mazurki appeared as a tough guy in hundreds of movies and TV shows including such classics as “Some Like it Hot” (1959) and “the Big Sleep” (1946). 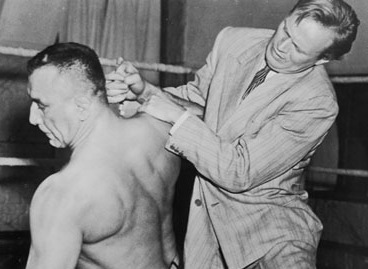 But he tapped into some disturbing depths as a character called “the Strangler” in the film noir classic, “Night and the City.” This dark tale of a London hustler out to fix the underground wrestling world contains one of the most violent fight scenes put to film up till that time, and with his harsh, craggy exterior, Mazurki invokes little sympathy from the audience. It’s a brutal performance. Perhaps poised to be the first wrestler-turned-actor with some true marquee value, Dwayne “The Rock” Johnson’s film roles have been mostly testosterone-laden. In movies like “The Scorpion King ” (2002), “Walking Tall ” (2004) and “Doom ” (2005), Johnson gives his WWE fans just what they expect. But in “Be Cool,” the Rock shocked everyone with a truly hilarious performance as Elliot, a gay bodyguard with dreams of stardom. In fact, most critics pointed out Johnson as the sole bright point in the disappointing sequel to “Get Shorty ,” outshining co-stars John Travolta, Uma Thurman and Vince Vaughn. 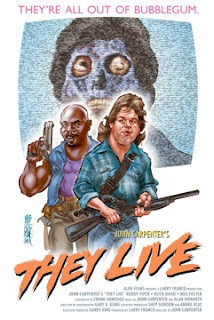 Co-written and directed by John Carpenter, “They Live” is one of the last truly great B-Movies. “Rowdy” Roddy Piper stars as Nada, a construction worker who discovers a pair of sunglasses that allows him to see through the disguises of aliens hidden among us; Aliens who are taking over the world through subliminal messages planted everywhere. Seemingly innocuous advertising impels the mindless masses to “Submit to Authority” and “Consume”. The metaphor is as subtle as Piper’s acting, but it all works, thanks to a snappy script and some simple yet really creepy effects. One of the best film commentaries on the Reagan era. It’s all part of the act: wrestlers are larger than life, their public personae sometimes the polar opposite of their actual personalities. With this kind of intensive method acting, wrestlers may well be perfectly suited to transition from the ring to the screen. We may not see Triple H in “Brokeback Mountain II,” but with The Rock tapped to bring “Johnny Bravo” to life, it seems as if fewer holds are being barred. So to speak. The super-swanky THEY LIVE poster pictured to the right was done by Bob Fingerman for an art show of movie posters reinterpreted that I curated. Thanks, Bob!